Great news SLIDE Members! 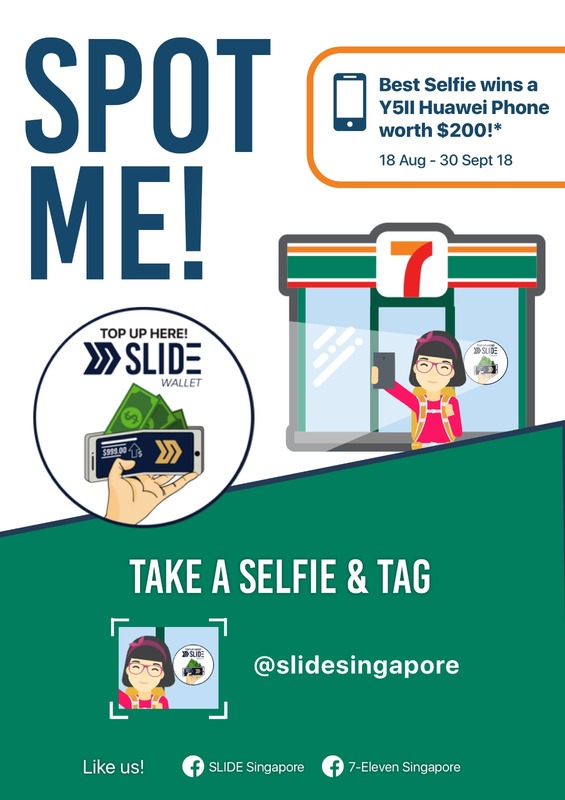 50 selected 7-Eleven stores are now available for you to top up your SLIDE Wallet to make use of all the services offered in the ‘SLIDE Member’ app. Watch the video below to know how to top up your SLIDE Wallet at 7-Eleven. To celebrate this awesome partnership with 7-eleven, we’ve prepared great promotions for you to enjoy! Spot the decal and stand a chance to win a Y5II Huawei Phone. Here’s how: Take a selfie with the decal, post of facebook, and tag @slidesingapore. Like SLIDE Singapore Page and 7-Eleven Facebook Page. Valid until 30 September 2018. Click here for full terms and conditions. Why queue when you can SLIDE? Sign up for a “SLIDE Member” Account using promo code: 711 to get a *FREE Remittance to use to send money to Philippines, Indonesia or Myanmar. Promotion is valid from 30 April to 30 May, 2018. Click here for full terms and conditions. Topping up your SLIDE Wallet has never been this convenient! Go down to any nearest 50 selected 7-Eleven stores to top up your SLIDE Wallet. With every top up, you will need to pay $0.50 convenience fee which will be returned to you as a cashback. Promotion is valid 30 April to 31 July, 2018. Click here for full terms and conditions. Got more questions? Visit our FAQ page and we’ll do our best to dish up some help. If you prefer to contact us over phone, click here.